If you’ve just been diagnosed with celiac disease or gluten sensitivity I know you must be very overwhelmed. Not only do we need to worry about what we eat, but we also need to worry about cross-contamination. This is an issue not only at restaurants and eating at others houses, but also in our own kitchens! I know this seems like a big task but I’ve outlined a few tips and tricks to help with this. Ideally, I would say remove all gluten from your house. Unfortunately I know this is not an option for many people due to roommates or family members that are not eating gluten free. 1. Remove all flour and baking products with gluten. Airborne gluten can make you sick and flour can settle on clean surfaces. Make a rule in your house that only gluten free flour is allowed. 2. Separate all gluten free products and label them. I keep all of my gluten free items in boxes with labels, therefore there is no confusion and I know where my food is. I recommend doing this in both the pantry and the refrigerator. 3. Buy a separate toaster where only gluten free products are allowed. All the bread crumbs from gluten containing products will get you sick. 4. Replace any plastic utensils and nonstick pans. These items get scratched easily, therefore they harbor gluten. No matter how much you clean them, you run the risk of getting cross-contaminated. 5. Buy a new colander and any wooden spoons you use for cooking. The little holes in colanders are hard to fully clean and can hold traces of gluten. The wooden spoons are porous; therefore gluten can remain inside them. If you have a self-cleaning oven, use that. If not, then make sure you really clean and scrub all surfaces really well. Don’t forget to really scrub the racks and the drawer under the oven that harbors crumbs. 7. Clean your microwave and use a microwave lid while heating your food. I learned this one the hard way. I got very sick one time by using the microwave without a lid on my food after gluten was in it. If I go to someone’s house I bring the lid or heat my food with the Tupperware lid on it. 8. Use separate cutting boards for gluten free items. I think this is something people don’t think of. I think it is helpful to buy colored cutting boards and then everyone always knows (for example) red means gluten free. I know this sounds crazy and overwhelming, but trust me taking precaution will prevent you from getting sick. 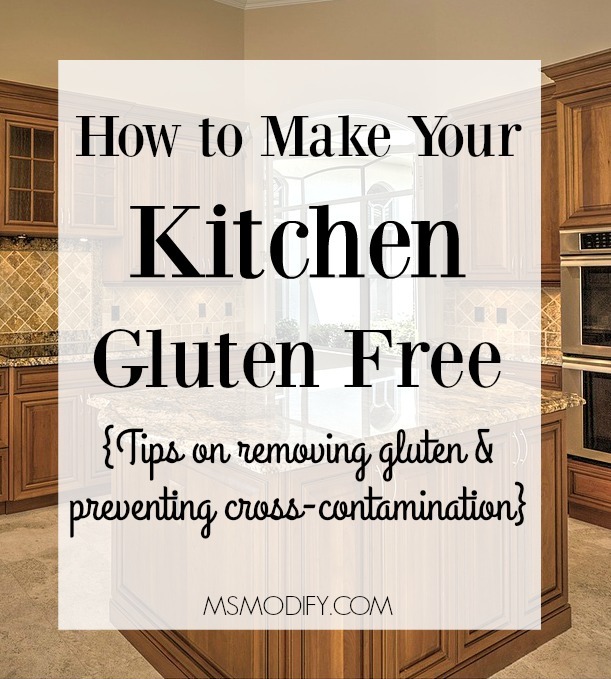 I would love to hear some of your tricks on how you keep your kitchen safe from gluten products! This entry was posted in celiac disease, Health/Wellness, Lifestyle and tagged cross-contamination, gluten free, kitchen.